Although other lesions containing giant cells do occur in other bones of the body, they are much less frequent and are generally felt to be variants of other tumors, most often a low-grade osteosarcoma. Diagnosis of central giant cell granuloma is made histologically from an incisional biopsy. 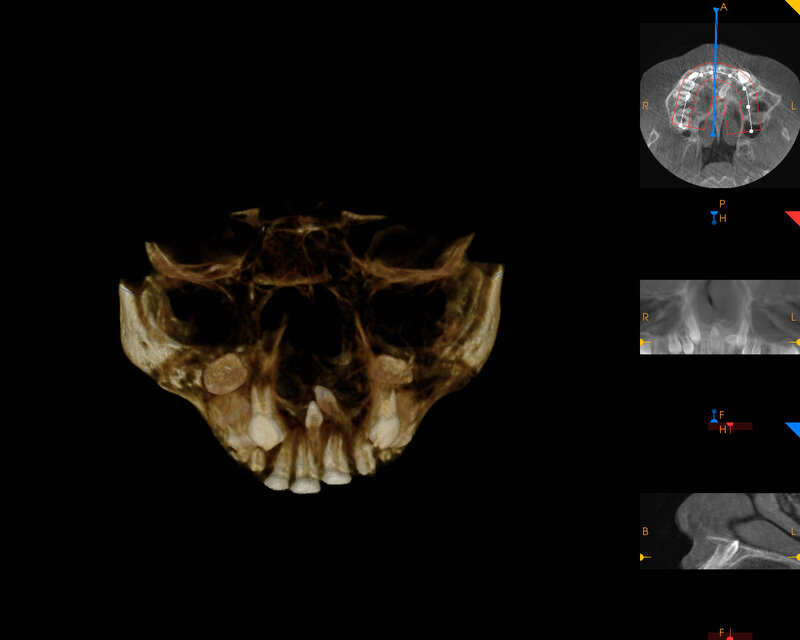 The brown tumor of hyperparathyroidism. 1. 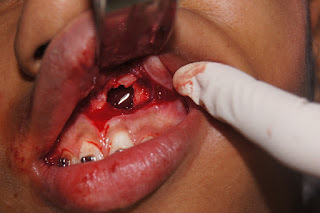 Enucleation and curettage. 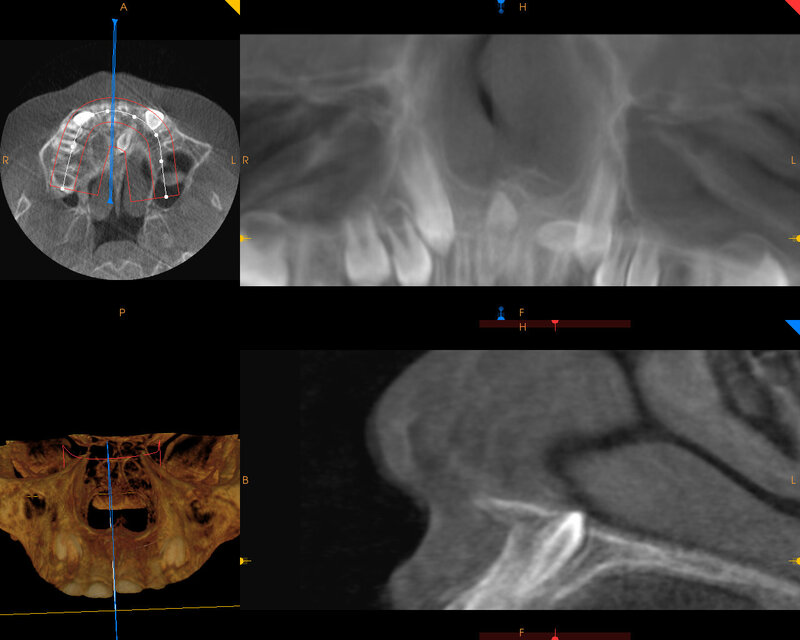 Despite this, a recurrence rate of 15-20% is often quoted, and in these cases treatment may need to be more aggressive and may need to consist of an “en bloc” resection. In the United States only salmon calcitonin is available, and although it is more potent than human calcitonin, antibody formation can limit its effectiveness. Results from the use of calcitonin have shown fairly high success rates. Based on the assumption that this lesion may be vascular in origin, subcutaneous alpha interferon has been used in the treatment of this lesion. It is given for its anti-angiogenic effects, though there is little evidence that the lesion is vascular in origin. The treatment has shown some success, but its use is limited by its side effects. Below see a case treated with both Intralesional steroid injections and Calcitonin on a 12 year old with a 5 year follow up with no recurrence. A mesiodent is an extra tooth in the maxillary anterior incisor region. Mesiodentes are the most common supernumerary teeth, occurring in 0.15% to 1.9% of the population. The etiology of mesiodens is unclear, but is twice prevalent in males (possibly an autosomal recessive gene), and there is a familial trait. 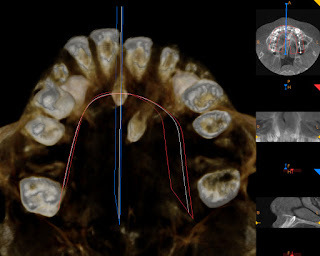 Proliferation of the dental lamina and genetic factors have been implicated. 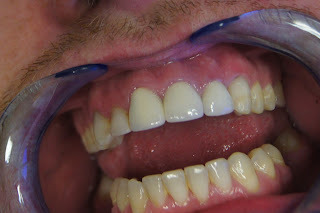 Mesiodentes can cause delayed or ectopic eruption of the permanent incisors, which can further alter occlusion and appearance. Mesiodens sometimes interfere with eruption of permanent teeth and cause other alignment problems with the existing teeth. 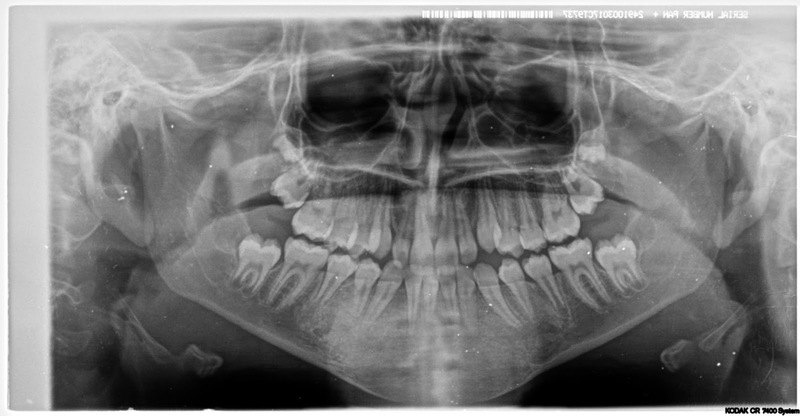 Only a small portion of supernumerary teeth eventually erupts. 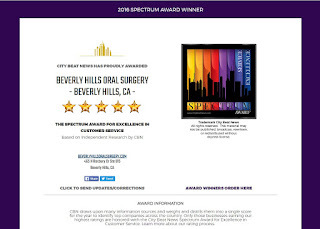 To prevent additional damage such as misalignment and delayed eruption of the permanent central incisors early intervention is suggested. 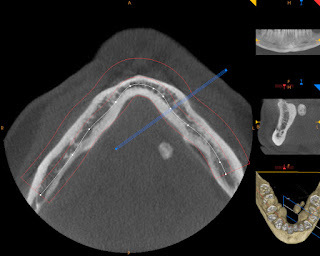 Usually it is preferred to wait until the root of the central and the lateral teeth are completely formed before mesiodents are removed. Mesiodens have been found in certain syndromes such as cleft lip and palate, cleidocranial dysostosis, and Gardner's syndrome. Supernumerary teeth in general have associations with Ehler-Danlos syndrome, Apert syndrome, and Down's syndrome as well. 6. 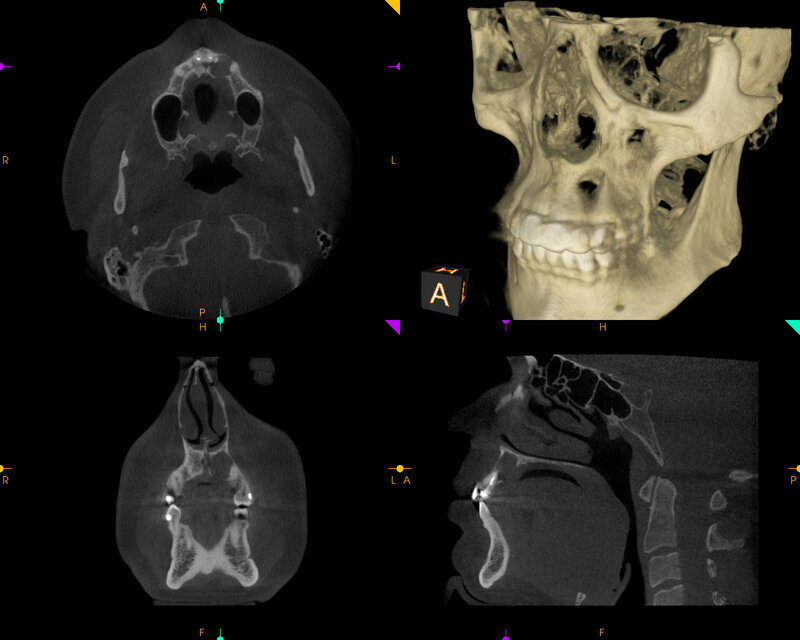 Eruption of mesiodens in to the nasal cavity..
Below see two cases that show the mesiodents erupting in to the nasal cavity. Globulomaxillary cyst has been considered to be a developmental cyst that arises from entrapped nonodontogenic epithelium in the globulomaxillary suture. 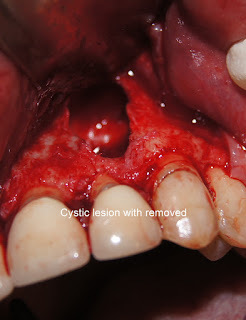 In recent years existence and histogenesis of this lesion has been disputed. It had been argued that the anterior maxilla was formed by merging of growth centers rather than fusion of facial processes and therefore, ectodermal entrapment was ruled out. 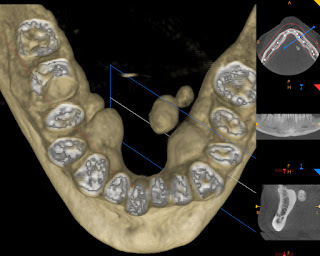 Recent embryologic studies have demonstrated that Fusion of facial processes does occur, and epithelium is entrapped in areas that later will lie between the maxillary lateral incisors and canines. At the present Globumaxillary cyst has been removed from WHO classification of non odontogenic cyst and some argue that it needs to be reinstated as a developmental non odontogenic cyst. Below see a case which could potentially be argued both ways. 40 year old male presented with swelling of the space between maxillary left canine and lateral incisor. 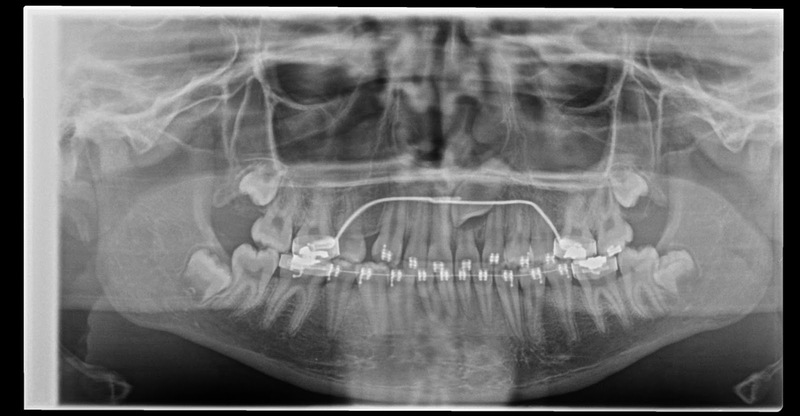 Patient had been treated with a root canal treatment years go on teeth #8, 9, and 10 and does not recall why. 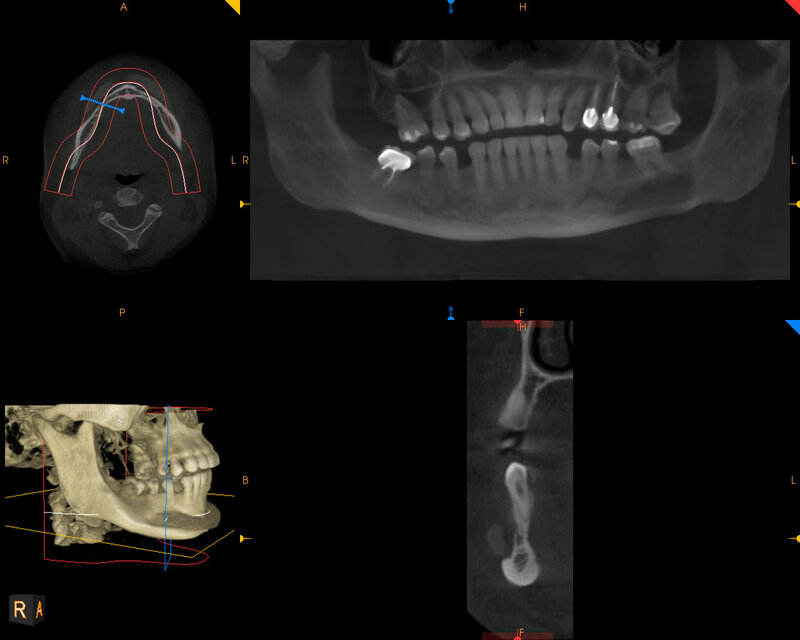 He denies history of trauma to the anterior maxilla. 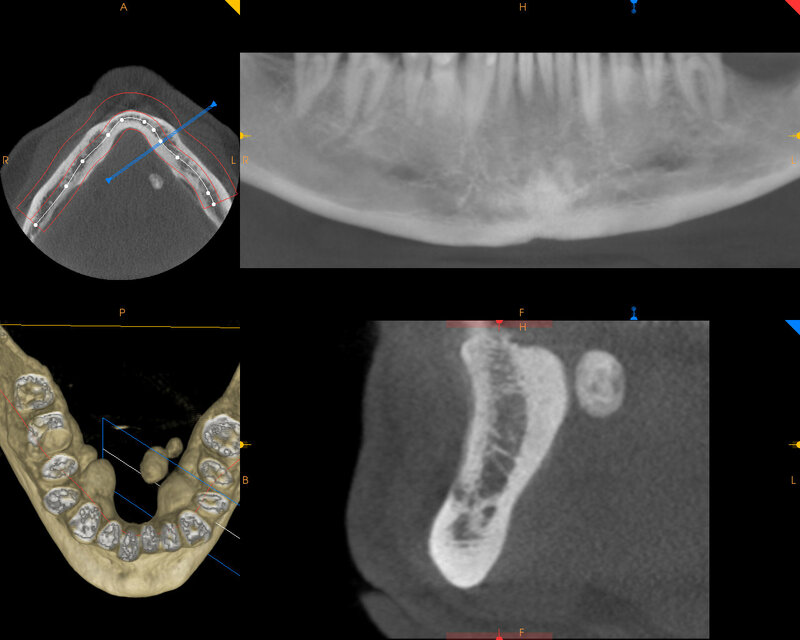 Panoramic x ray disclosed potentially an endodontic lesion in apex of #10 and cystic lesion that has resulted in root divergence in the area of tooth #10 and 11. Tooth #11 has tested vital and has been ruled out as a potential source of the lesion. 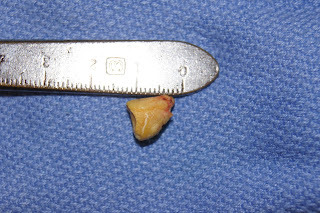 Pathology was consistent with both periapical lesion arising from tooth#10 and a non odontogenic cyst. 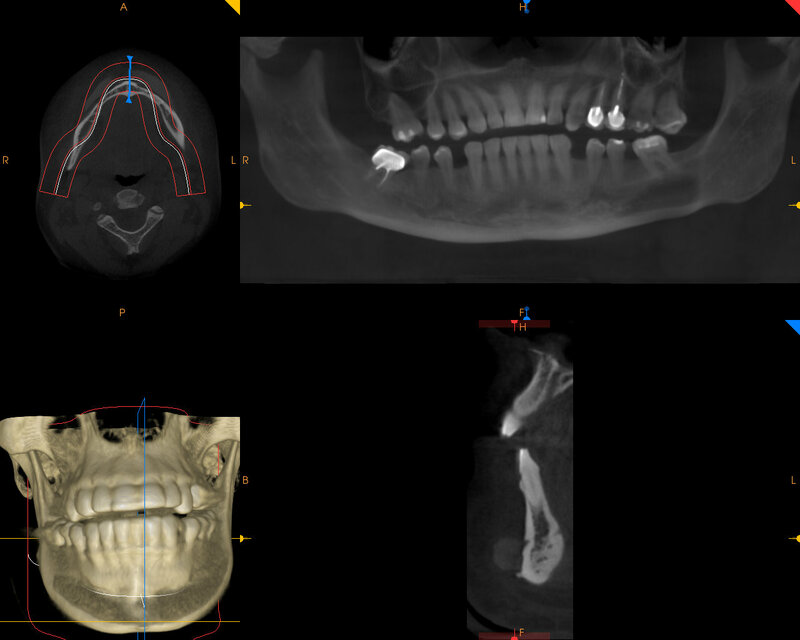 34 year old female was referred from her dentist for mandibular swelling. 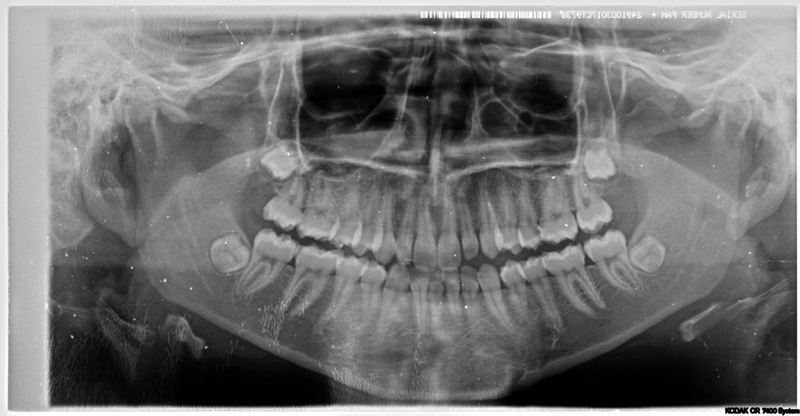 Patient was complaining of lower jaw pain and swelling of 2 days duration and has been febrile for the past week. Health questionnaire was also negative for any systemic disease and patient claimed no past surgical history. 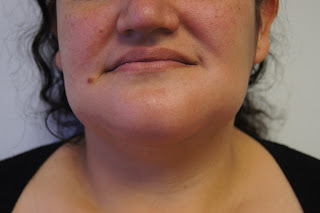 Examination of the face was consistent with lower facial swelling not extending beyond the lower mandibular border and skin was flushed and warm to palpation. Bilateral mandibular body and chin and all lower teeth were tender to palpation and all lower teeth have plus 2 mobility. No decay was observed on any of the lower teeth. 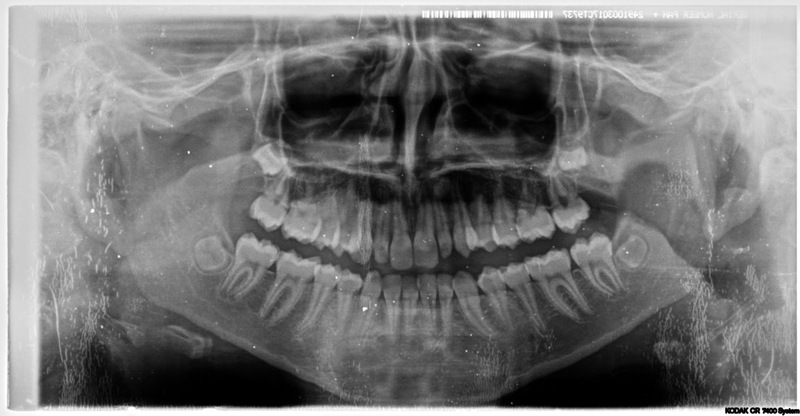 Panoramic x-ray was taken and no odontogenic source for the infection was identified. 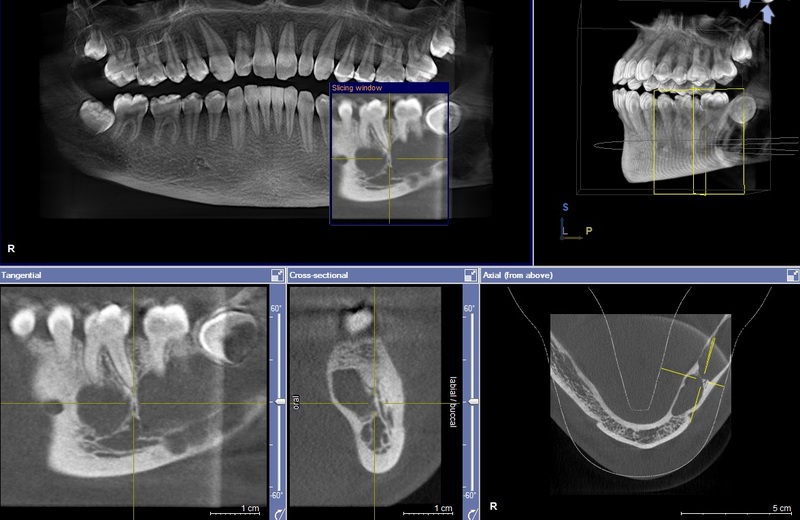 Periodontal exam was also negative. A Cone beam CT was taken and a silicone mandibular implant was identified spanning from right mandibular body to the left. The implant had resorbed the cortical bone. 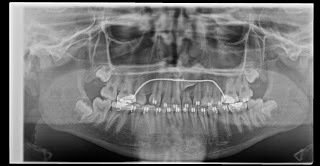 Upon further questioning about past surgical history patient said she was embarrassed and did not disclosed the implant placement since her husband might find out!! IV antibiotic was given and the implant was removed under general anesthesia. 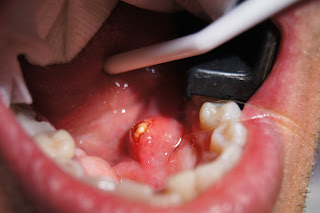 Most common odontogenic tumor is an Odontoma. 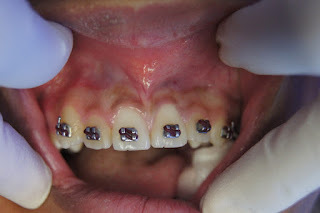 Odontomas are considered to be hamartomas rather than neoplasms. 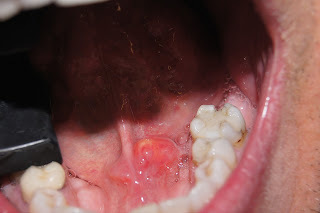 These lesions are composed of tissues native to teeth: enamel, dentin, cementum and pulp tissue. 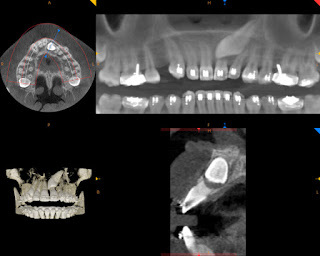 Odontomas are classified based on their gross and radiographic features into compound (small tooth like structures) or complex (a conglomeration of dentin, enamel and cementum) Clinical symptoms are uncommon, however, an affected patient may present when a permanent tooth or multiple teeth that fail to erupt. 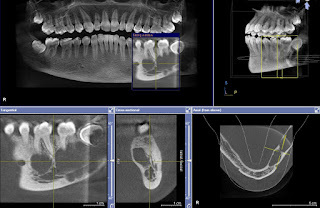 Usually, odontomas can be confidently subclassified based on the Xray appearance. 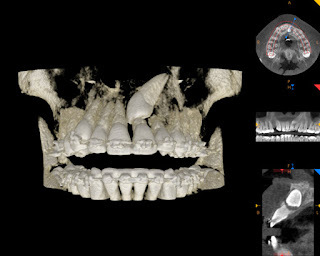 Compound odontomas appear as a collection of small teeth. 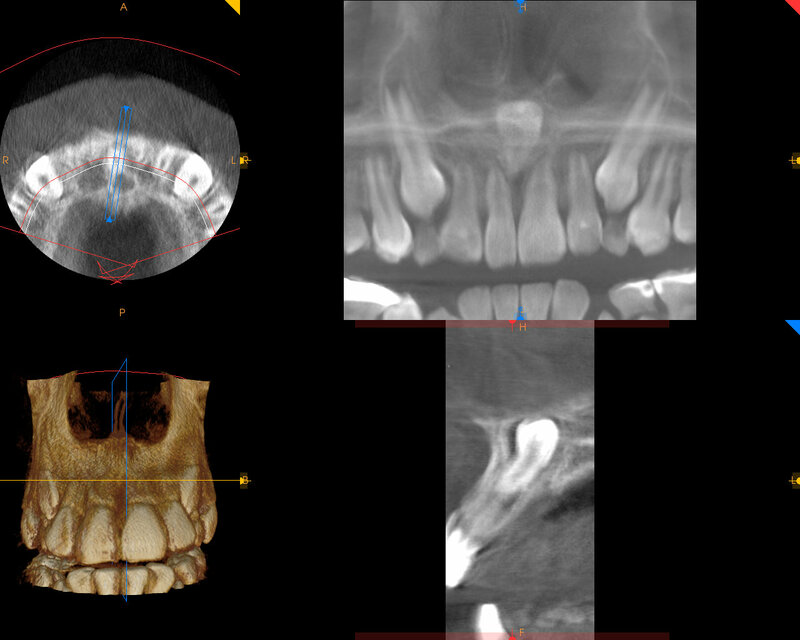 Complex odontomas appear as a radioopaque mass which may result in a wider differential diagnosis. 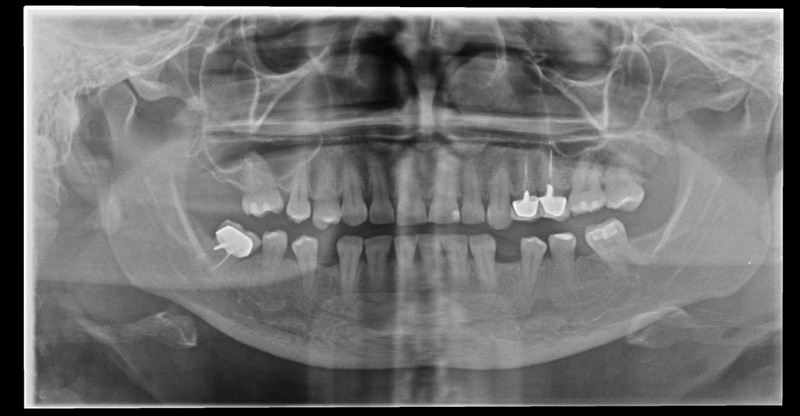 Below is a case of a 16 year old male who was referred for removal of his wisdom teeth. 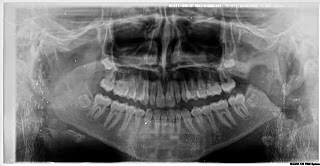 Panoramic x ray was consistent with compound odontoma. CT scan was obtained to assess best access point to remove the lesion. 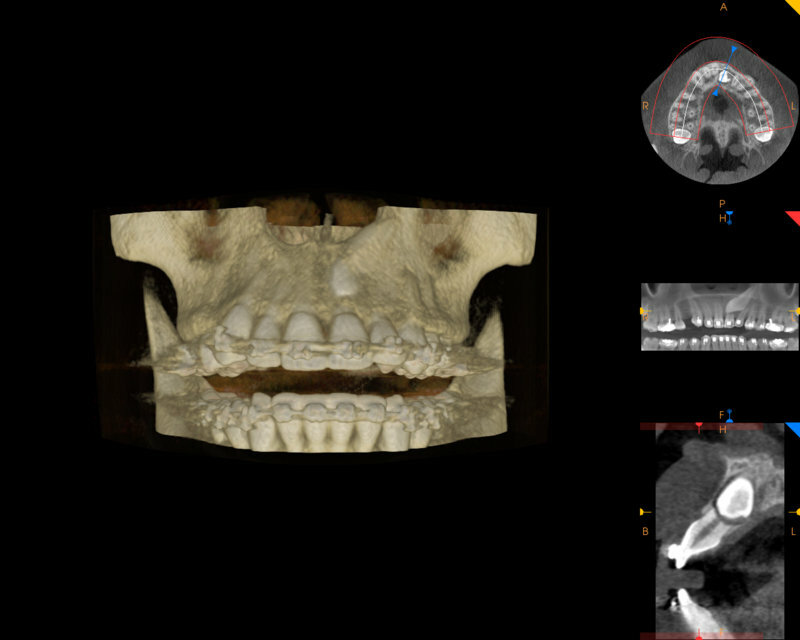 The traumatic bone cyst is an uncommon non epithelial lined cavity of the jaws. 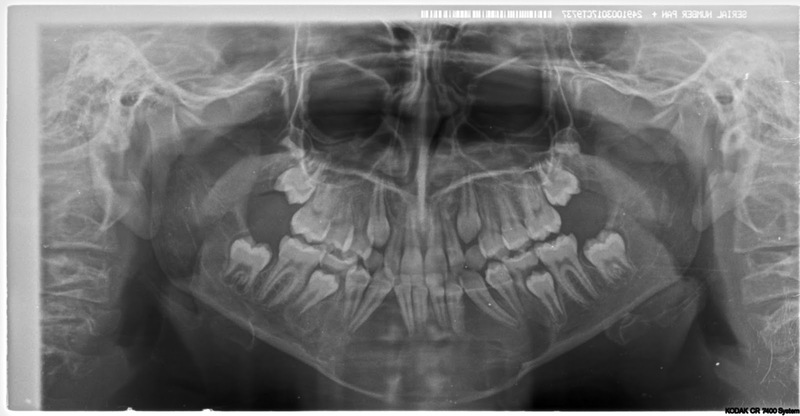 The cyst is mainly diagnosed in young patients most frequently in their teen. Most of these lesions are located in the mandible. 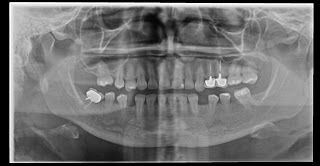 These lesions are asymptomatic in the most of cases and are often discovered on routine dental X-rays. Since epithelial lining is non existent, microscopic diagnosis may be difficult. 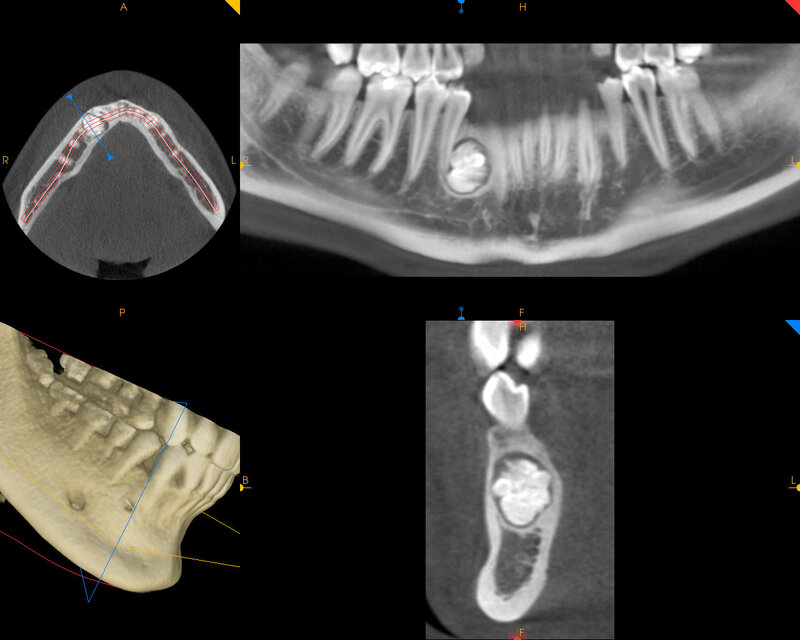 Below see a Ct scan of a 15 Year old male athelete presenting to our office with large cystic lesion of left mandibular body which was discovered on panoramic x ray when he was consulting an orthodontist. At surgery, we discovered a large cystic lesion devoid of any epithelium. 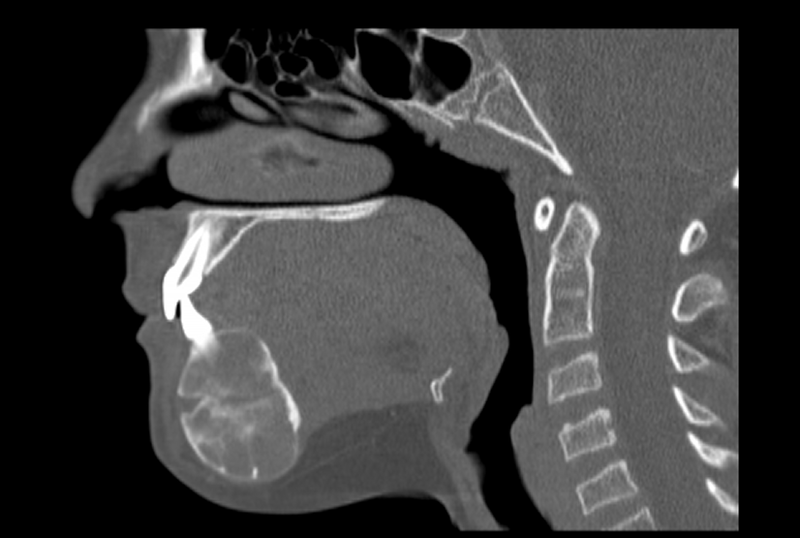 Scrapings of the cyst was consistent with diagnosis of Traumatic bone cyst per pathologist. 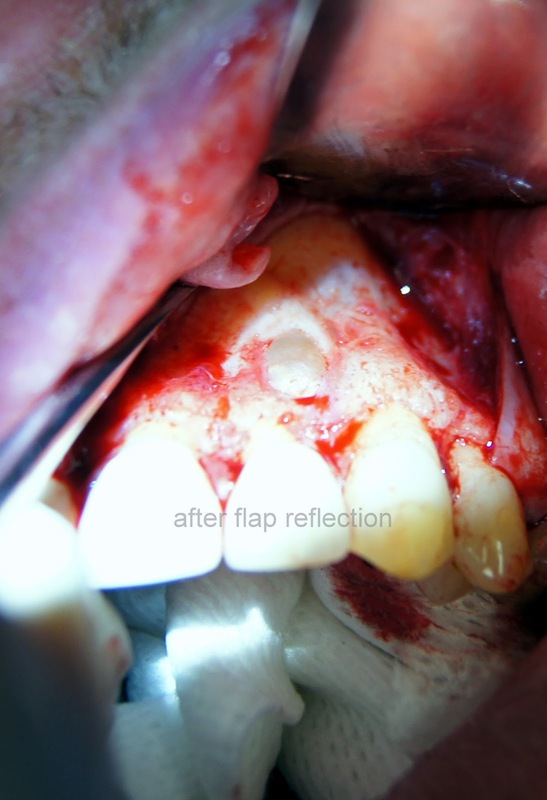 The recommended treatment for this lesion is surgical exploration followed by curettage of the bony walls. The surgical exploration serves as both a diagnostic and as definitive therapy by producing bleeding in the cavity. 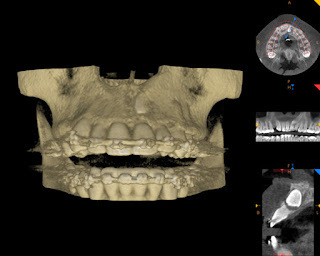 Blood clot formation in the cavity is eventually replaced by bone.